Season 3, Episode 6: Guy Walks Into an Advertising Agency, was one of the more wrenching episodes of the season, and not simply because of the foot vs. riding lawn mower scene (words fail to describe that gem). 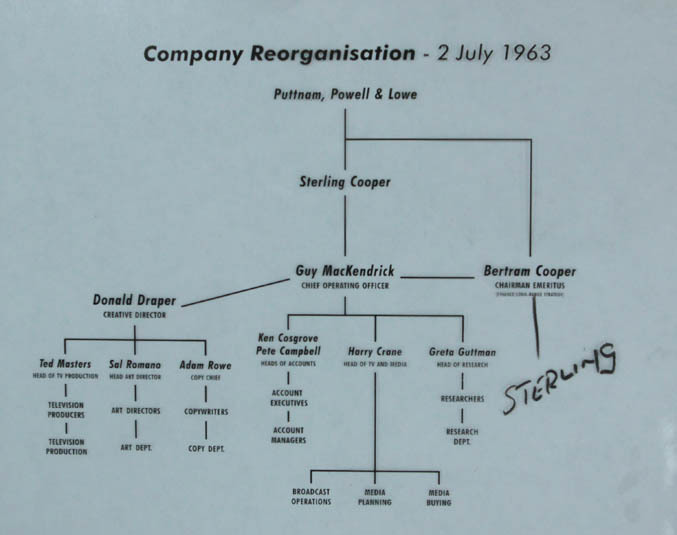 Over the course of the previous five episodes, the fictional ad agency of Sterling Cooper underwent a process of eliminating a number of positions following their sale to a London based agency. For the most part, cuts occurred throughout entry and middle level positions while only one executive position was supplanted by replacements from the new owners. The motivation behind the restructuring was the Londoner’s desire to improve efficiency while reducing costs in a way that wasn’t common practice throughout peer firms on Madison Ave.; simply put, they wanted to implement a new business model. What’s worth noting here is that the changes implemented by the new owners have actually produced favorable results, albeit only after a great deal of positive conflict refinement from the firm’s human assets in the creative department. But when the new owners cross that final line and decide to neuter the remaining components that made the firm worth buying in the first place, things start to fall apart. Failure to implement the final stages of the process without including relevant stakeholders ultimately leads to the new owners losing everything they invested along with a great deal of professional and personal reputation (although that doesn’t happen until seven episodes later). Granted, for profit business models makes it much easier to disregard input from employees but that’s not always the best decision. Why care about stakeholders if it isn’t required? For one thing, if anyone speaks out, regardless of his/her position or history with the organization, the objections are easy enough to placate while marching ahead with original plans, as illustrated in Guy’s “correction” to the new org chart. Having designed and led more than a fair share of reorganization and institutional evaluation projects, one of the few universal elements that can be applied is that they always have a number of human asset oriented problems to overcome. Although it is easy to begin an institutional review process by examining the most pressing expense-oriented items, the projects of mine that have produced the best long term results always begin by evaluating components that have the most impact on overall institutional efficiency and revenue development. Once this is complete, the organization will be in a better position to examine remaining components. Ultimately, if there’s anything worth gleaning from Mad Men as it relates to discussions of new orchestra business models, it is this: look before you leap because accounting for dynamic variables isn’t something easily accomplished after decisions are made. In the worst of cases, you could end up losing more than your reputation.